A positive month with gains in all my asset classes. 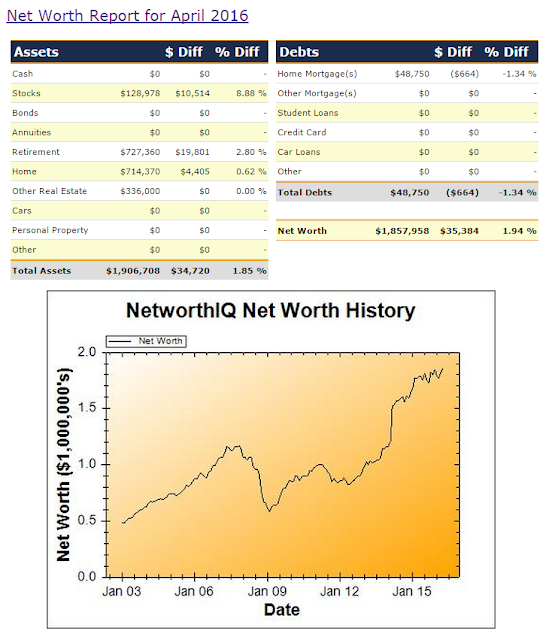 The local and global stock markets improved during April, adding $10,514 to my net worth. This was a rise of 8.88% due to the gearing employed in my stock portfolio. My retirement savings (SMSF and employer superannuation fund) grew by $19,801 (2.80%) due to investment gains and a couple of months' worth of employer contributions being deposited during April. The estimated valuation for our home (based on median sales prices for our postcode) grew by $4,405 (0.62%), reflecting the continued rise in Sydney real estate prices, although at much more subdued rate than during the past couple of 'boom' years. This figure might vary a lot over coming years, with downside risk is there is a 'correction' in Sydney house prices (which are at historically high ratios to household income), possibly triggered by either rising home loan interest rates or possibly changes to the tax rules for capital gains and negative gearing. On the other hand, there is considerable upside 'risk' due to the pending completion of the nearby public hospital and associated rezoning and redevelopment of our neighbourhood. We had some surplus funds accumulated in the savings account linked to our home loan, so I transferred most of the surplus to our home loan, reducing the outstanding balance slightly. As usual I left the estimate valuation for the rural property my parents gifted to me at the start of 2015 at the transfer price.